While the football forecast in Eugene seems a little cloudy at times, there is one position group that will give Duck fans a sunny outlook. The Oregon linebacker corps boasts the return of seniors Rodney Hardrick, Joe Walker, Tyson Coleman and Christian French, under the guidance of linebackers coach Erik Chinander. 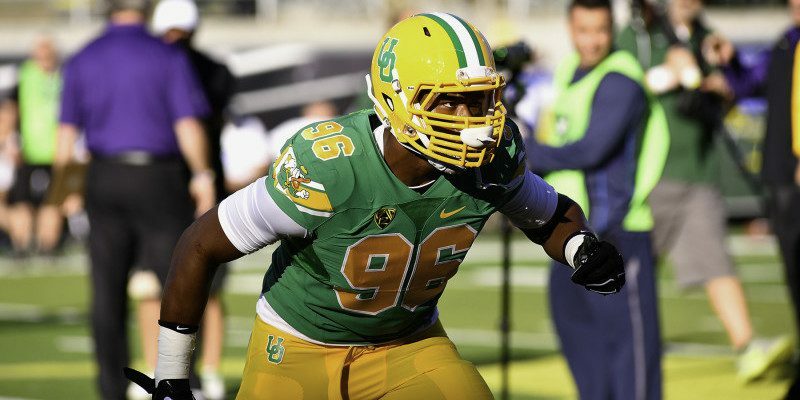 These football veterans have become a seasoned and formidable crew, and are the latest mentors for Oregon’s newest defenders. 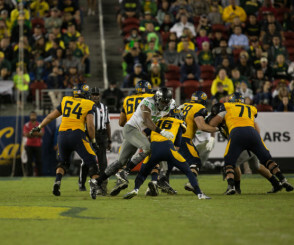 As French enters his final season in only his second year at linebacker for the Ducks, the redshirt senior is already receiving comparisons to his former teammate, Dion Jordan. Initially recruited by former Oregon Head Coach Chip Kelly as a tight end, the talented multi-sport athlete from Cedar Rapids, Iowa has adapted and matured during his time at Oregon. After spending two years on the defensive line, French moved to linebacker in a backup role last season. Despite the position changes, French has continued to evolve as a leader and a player by making the most of his opportunities. There are strong indications this could be the year that French makes the connection, binding an experienced group together for one last championship campaign. French recovers a fumble against Wyoming last season. In his second year as linebackers coach, Chinander has ignited a flame of discipline and excellence in Eugene after a season with the Philadelphia Eagles as an assistant to former Oregon defensive line coach Jerry Azzinaro. With a focus on sound technique, Chinander has yielded impressive results, rapidly transforming players such as Walker and French into effective defenders. Last season, French made the transition to linebacker. While primarily a backup, the 6’5″ 250 lbs. former defensive lineman made a strong impression despite his limited playing time, finishing the season with 26 total tackles, 7.5 tackles for a loss, and 6.5 sacks. French’s success is both a testament to his work ethic and acumen, and also Chinander’s ability to develop and redistribute talent. 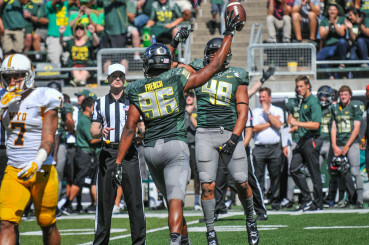 Chinander was also instrumental in the cultivation of former Oregon and current NFL strongmen such as Kenny Rowe, Brandon Bair and Dion Jordan. 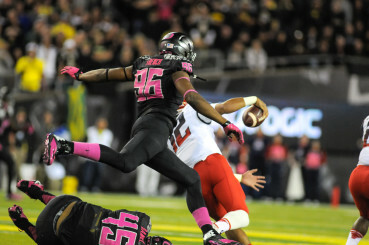 The primary focus for the Oregon defense remains on tackling, both in the trenches and in the open-field. A good tackler can find his proper positioning, relying on quick feet which allow him to square up, get set, and derail an opponent coming at him with a full head of steam. “Footwork and being able to break down and make tackles is a big thing for our team,” French said. French sacks California quarterback Jared Goff. “For the defense as a whole, it’s to get better at open-field tackling. Another thing is striking. Everything we have to do relies on our ability to strike,” French said. Linebackers are the plumbers on the field, plugging any unwanted leaks that spurt through the line. In order to be effective, a linebacker has to get off blocks, requiring fast, strong hands able to neutralize a blocker. Like footwork, hand control and placement are of chief importance for French and Co. In 2010, shortly after graduating, French left his home town of Cedar Rapids for reasons other than football. At the time, the young star from Kennedy High School chose the second-ranked Ducks over hometown favorite Iowa. French even turned down offers from Wisconsin, Notre Dame, Texas A &M, and Missouri. It was important for French to discover his identity away from home; to become a man on his own. By accepting a scholarship from Oregon, the all-star tight end made his first big decision to move hundreds of miles from home and play championship caliber football for the Ducks. This week, FishDuck.com asked whether or not the top recruit out of Iowa and 87th national prospect by Rivals.com still stood by his decision to come to Eugene and achieve his goals, both as a football player and as a man. French hunts down Arizona quarterback Anu Solomon. “I left home for a reason, to get out and grow up. I feel like I’ve definitely done that and matured as a man,” French said. For the 2015 season, Oregon’s linebacker corps consists of several young players with natural talent and all-star potential. Younger players such as redshirt sophomore Danny Mattingly and sophomore Jimmie Swain as well as JUCO transfers Paris Bostick and Jonah Moi will benefit from the experience of these veteran players. French has embraced his new role and enjoys sharing his knowledge and love for the game with his fellow defensemen. Every coach dreams of teaching a player who has the adaptability, fortitude, and resilience that French has demonstrated at a variety of different positions. In his final year before continuing his dreams in the NFL, the young man from Iowa will be looking to make an impact, showcase his skills, and elevate his team to higher level. The time is now for Duck fans to start speaking French.